Food Hussy Review: Vinoklet Winery Dinner | The Food Hussy! 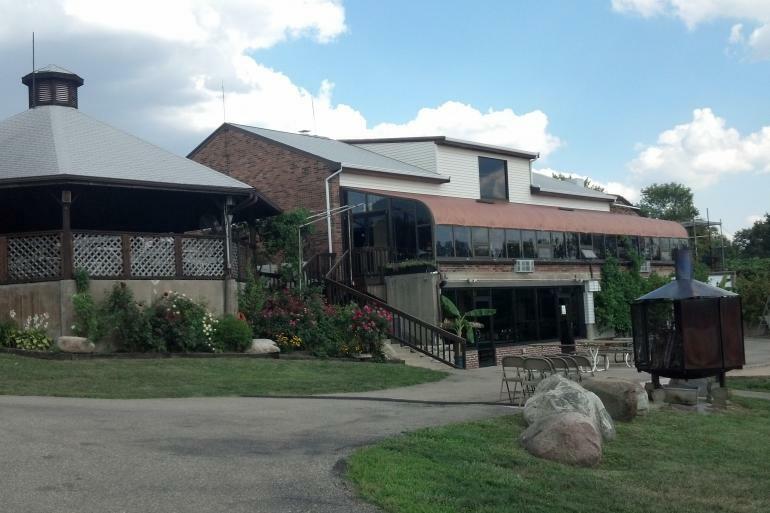 Recently I went to a birthday party at Vinoklet Winery in Colerain. Vinoklet is on the grounds of their vineyard and there's also a pond where lots of folks have weddings and parties. They also have movies on the lawn on a large inflatable screen as well as a fire pit. The path and grounds are really pretty in the summer - with black eyed susans and giant hibiscus! Here I am with the birthday Hussy - she is a long-time friend and I was thrilled to celebrate with her! Vinoklet has a dinner menu to choose from for parties - everyone got a salad as well as a choice of entree, dessert and a half-bottle of wine. The nice thing was if you're in a pair - you got a bottle but if you were a single - you literally got a half-bottle! W00t! The salad bar was fine - pretty standard stuff - but good ranch. For the entree you could choose from NY Strip, chicken breast, salmon, shrimp kabob or pork chops. I went for the steak for sure. Now there's a little oddity to me in a grill your own restaurant - since I could just do that at home - but for a party - it was really fun! We all hung out around the grill and got to chat and give tips to each other. I have a lot of experience cooking steak - so I hope I was helpful. Along with the steak & salad they have a buffet of sides with potatoes, veggies and bread. It's pretty standard fare and nothing really special. To me, it's much more about the scenery and the event rather than the food. But the steak was good quality. Dinner - including the wine - was $39 - so it's a bit pricey considering you have to cook it yourself - but I feel like it's about the event - not the food - so it was definitely worth it. I totally can't remember which wine I got but I really liked it. I'm guessing it was a sweet white - that's what I typically go for. They have a good selection to choose from and everybody seemed to find something they liked. Why Should You Go? I would definitely go for an event or a wine tasting but I probably wouldn't go just for dinner with a friend.